here is an outtake from a day photographing at the indianapolis zoo. 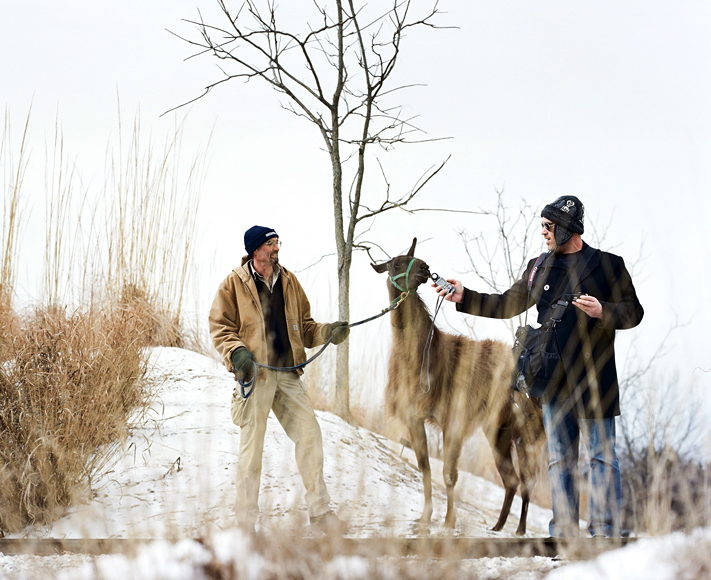 the guy on the left is curt and the llama is called major tom, and the handsome devil in the black coat is jason hamric, a good friend who was my assistant for the [almost month long] shoot. this day at the zoo was one of those times when the whole idea of what you do for a living is baffling. a day when you think "i'm getting paid for this?". i wish more people knew what that was like, and i count myself as amazingly fortunate to be able to support myself with what i love. shooting there may not have been "optimal" for everyone, as it was around 20 degrees, but i love the cold and got to photograph a llama (i LOVED llamas at some point in my life. sometime in college) AND people riding an elephant (Tombi), which i got to freaking pet! note: elephant skin is dry and strangely hairy. like long, spindly hairs coming from random places...you can barely see it from a distance. anyway it was a great day. by the by, the llama, major tom,...his father was/is called sergeant pepper, and allegedly his mom is eleanor rigby.